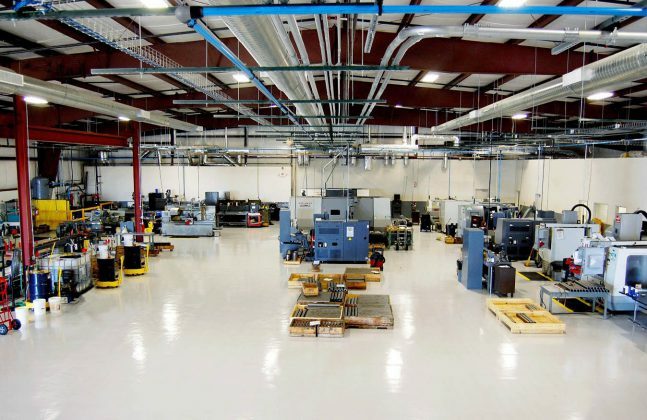 Industrial environments have very specific needs for their flooring systems, whether they are manufacturing plants, automotive areas or food processing factories. The image below of MCR Oil in Texas show some of the typical challenges that floors in industrial sites have to withstand, such as heavy machinery, potential for dropped tools, point loading from stacked pallets, pedestrian traffic and wheeled items. 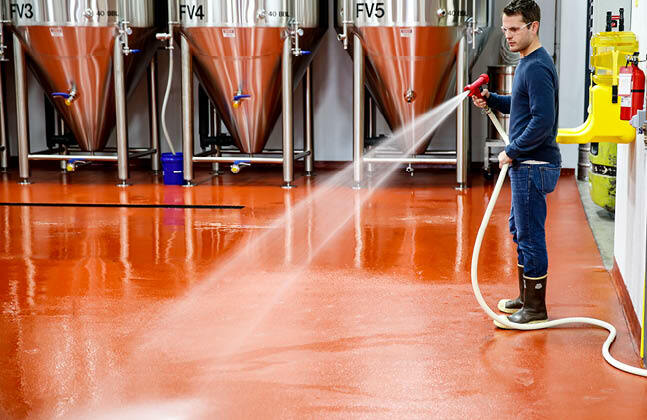 The flooring system needs to tackle these challenges whilst boasting impressive resistance levels against cleaning agents, aggressive chemicals and spillages. Sites that use hazardous or flammable chemicals should pay particular attention to the systems fire and temperature resistance, whilst sites that are exposed to steam cleaning, industrial ovens or are at risk of hot liquid spills should consider flooring with good thermal shock resistance. It is not just resistance to the initial incidents that need to be considered; spillages, for example, can cause areas of the site to become slippery, and so flooring properties such as slip resistance should also be studied. A popular choice for large areas, specifically in the manufacturing and food industries is a joint-free polyurethane system. The easy-to-clean properties of seamless systems means that dirt and germs cannot hide in crevices, but can be washed away quickly and easily. 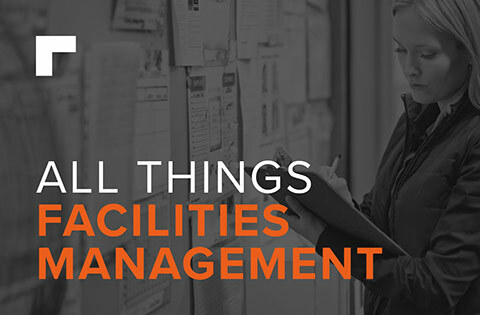 This is especially resonant for sites where food is prepared or packaged, where maintaining a high standard of hygiene is paramount. Ease of cleaning also keeps the flooring looking fresh, making for a more habitable working environment. 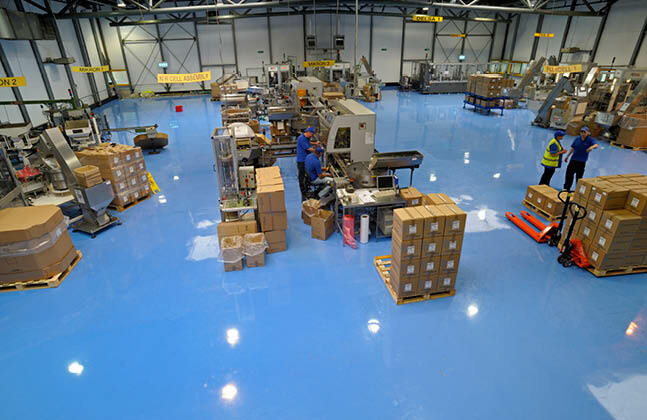 The use of different coloured areas in flooring can have huge benefits to a site; from separating walkways to highlighting areas of dangerous machinery or hazardous zones, to outlining where pallets should be stored so as not to cause obstruction. This is highly applicable in the Food and Beverage industry, where cross-contamination between zones needs to be avoided. An example of this could be having different coloured zones for different applications, such as red flooring in the zone where raw meat produce is handled and blue flooring in the zone where cooked meat produce is handled. Keeping these areas separated by colour and distance, with produce remaining in the right designated zone, can help to reduce the chance of contamination. 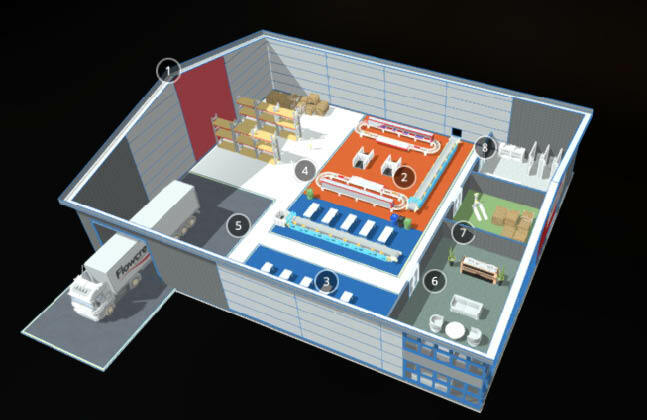 A further example of this can be seen in the 3D model below, with the blue flooring showing a wet processing areas and the orange showing a dry processing areas. This model is displaying the many varieties of polyurethane flooring systems, ideal for use in the food and beverage industry. Having a large expanse of a single bold colour also has its advantages, from creating a striking visual for employees and visitors being shown around the site, to choosing brand colours for the flooring or having a colour that will show up dropped or spilled items clearly. For market sectors such as production, closing an entire site during application can be problematic for the business. 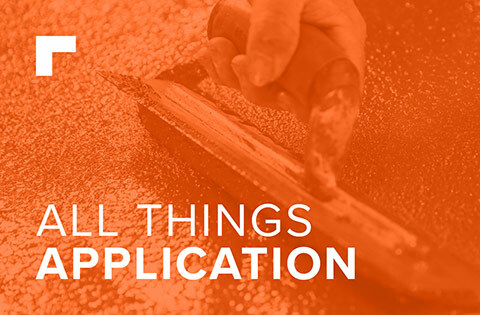 In cases like this, the speed of application is key and a fast-cure system becomes an extremely attractive option. 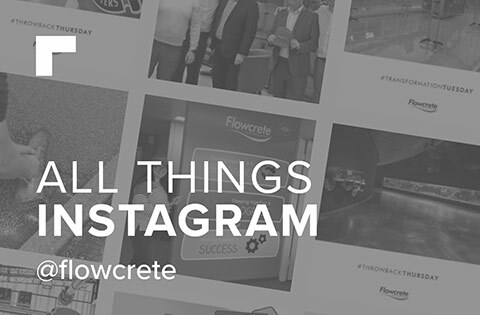 Flowcrete’s Flowfast Quartz for example is named as such for the rapid installation and cure-time, but this system also features properties such as slip and wear resistance, as well as being tolerant of sustained temperatures up to 70 degrees. Whatever the needs of a flooring system, it is not a decision to be taken lightly. 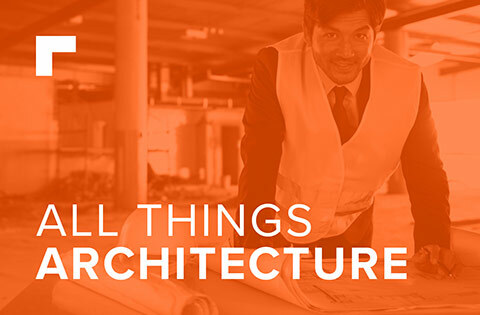 Making a list of necessities for the flooring, or for the working environment as a whole, can make the decision on the flooring system much easier and well informed.